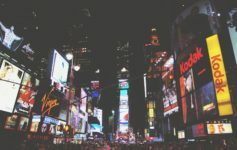 Family vacations are our treasured memories, so I am careful not to make choices that could lead to us being underwhelmed. With over 20 Disney World Hotel options, I had a hard time deciding which one to stay at. It’s a no-brainer – if you visit Orlando, a trip to Disney World is going to be one of the things on your must-do list. That’s the easy part. The toughie is in deciding which Disney World Hotel to stay at. With over 20 options listed on the Disney site, choosing the best Disney World Hotel will probably be the most difficult part of the holiday plan. I took a considerable amount of time to plan for this trip, with the bulk of the work involved in choosing the best Disney World Hotel. 3 main factors came into play here, namely the hotel location, price and the WOW factor. I knew I wanted to stay at a Disney property hotel because of the perks that came with it, so location was pretty much sorted for me. After reading a ton of reviews, I gravitated towards the Grand Floridian. Why? Because we had previously stayed at the Disney Grand Californian in Anaheim which was awesome, hence I knew that the Grand Floridian wouldn’t be too far off in terms of standards. That said, I almost chose the Disney Polynesian (which is right beside the Grand Floridian) because it too had a lot of great reviews. On TripAdvisor many travellers cite the Polynesian as the best Disney World hotel. 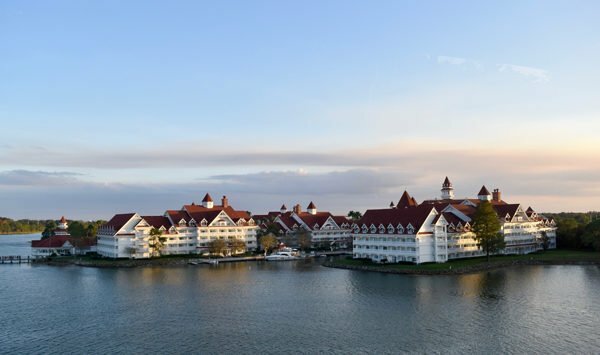 Having travelled there and seeing it first-hand, I would say that my kids and I much preferred the grand and luxurious look of the Grand Floridian. After all they do call it GRAND for good reason. We visited over Christmas in December 2017. 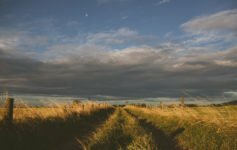 The weather was beautiful, despite it being December – which is exactly why Florida is also famously known as the Sunshine State. Just look at those lovely blue skies! Staying on a Disney property has privileges and conveniences. The first notable privilege is, that you get FastPasses. Fastpasses are similar to the Express passes you get at Universal Studios, which allows you to take a shorter queue at certain rides. This is essential if you want to save time for hot rides such as Avatar’s Flight of Passage. Staying at a Disney world hotel also means that you get to make Advanced Dining Reservations which is great when you want to plan for a nice meal. 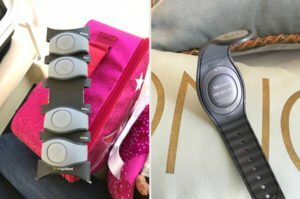 We also got free customised magic bands which we got to bring home as keepsakes – my kids got a real kick out of “paying for a stuff on their own” (all you need is the magic band, a pin number and VOILA, the Disney cashiers magically accept the payment.) There’s also extra magic hours and free transportation around the parks… need I say more? Of course you want to stay at a Disney World Hotel to complete your Disney experience. 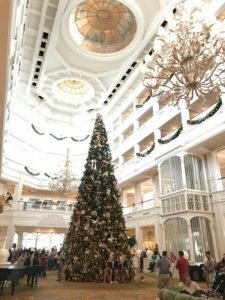 Check-in was a breeze at the Grand Floridian, despite it being really busy over Christmas. At first, we felt really bummed at the massive queues at the check-in counters. Then we noticed there was a special check-in for club assess which was empty! Another plus for choosing Club Level assess! The magic bands and our Disney itinerary packet were waiting for us and we were glad to learn that our room was already ready despite us arriving early! Great job Grand Floridian! Our buggy ride to the room! A buggy was sent to pick us up which thrilled our kids. The driver was lovely and gave us a neat tour of the grounds before bringing us to our room at the Sugar Loaf building – a nice outer building just footsteps away from the main lobby area. It’s very convenient. 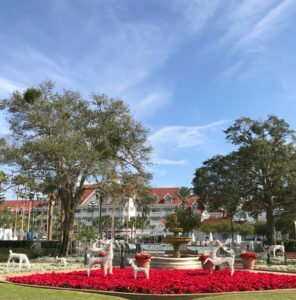 Grand Floridian – should you get the Club Level access? We chose to pay extra for club level access which means your party gets a free flow of breakfast, tea, alcohol, evening dishes and all-day snacks. 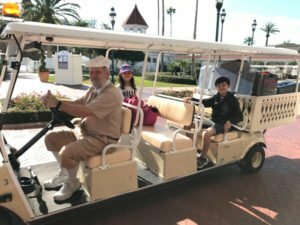 We’ve had club level access at other Disney hotels such as the Grand Californian and also the Disneyland Hotel in Anaheim, so we knew what to expect. Instead of the usual club room, the food was served in the ground floor lobby of the Sugar Loaf Building. The selection was good, especially at breakfast and we all found it extremely enjoyable. There are fruits and bottled water which you can bring to your room, which is great for me because I need a daily dose of bananas, blackberries and mineral water. The most memorable dish was the freshly made Mickey Mouse Waffles at breakfast time. Character waffles always seems to be an important way to complete any Disney holiday and these mickey mouse waffles are delicious. 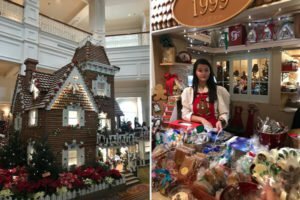 There was a giant gingerbread house full of treats in the Grand Floridian lobby with a queue of people waiting to get their hands on some Christmas treats. Needless to say, we felt compelled to join in the fun and queued along happily. Did you know that the Grand Floridian has been selling gingerbread houses since 1999 for 19 years? Wow we couldn’t believe it either! So we took the opportunity to buy a whole gingerbread house and brought it back eagerly to our room. 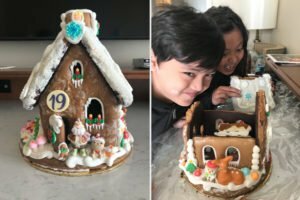 It was a real Hansel and Gretel moment watching my kids demolish the house with glee. Totally worth it. There is a lovely pool and heated jacuzzi just steps away from the Sugar Loaf building. We visited it once and found it incredibly hard to get out of the jacuzzi. It was utterly relaxing. While at the pool, my hubby casually told us about a horrific alligator incident that happened a few years back. I thought it was a joke at first but sadly it is true that a young child was snapped up by a travelling alligator right at the shores beside the pool. That explains the warning signs around the shores at the Grand Floridian. Yikes..
Is it easy to get to the Disney Parks from the Grand Floridian? Yes it totally is. We travelled by shuttle bus most of the time. But there was also the monorail and boat ride available. 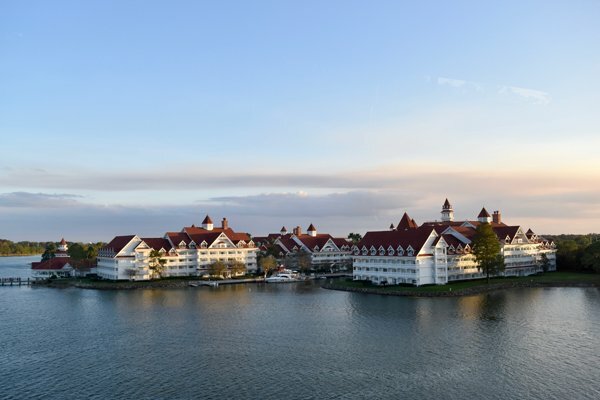 How much does it cost to stay at the Grand Floridian? 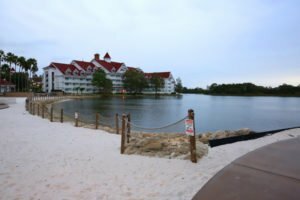 We stayed 3 nights at the Grand Floridian with Club Access and a 3-day Park Ticket. The price was USD$3377 or SGD $4727. It is pretty pricey but I really wanted a memorable experience since we were travelling all the way from Singapore to Disney World. We later moved to another Disney property called the Swan & Dolphin which was much more affordable and lovely. My kids liked it just as much because I managed to snag a huge room. 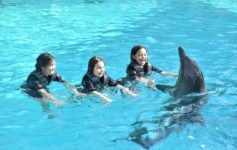 Read about my review of the Disney Swan & Dolphin next or check out these travel tips. Previous Article Never. Stop. Believing.